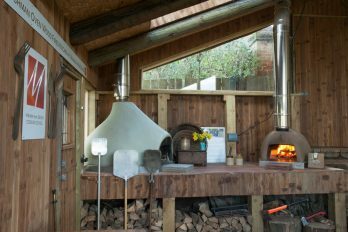 If you want to spend a day or more cooking with family or friends in a relaxing atmosphere with expert tuition, Manna from Devon is the ideal place. Whether you are a work group, hen party, a book club, a college reunion, or just friends wanting to learn together, we can create a class to fit your exact requirements. Just call or email and we’ll start planning. Tapas – bite size perfection. All workshops will be custom built to suit your ideal needs and can take place here in our custom-made cooking space. It’s also a great space to get together for a celebratory meal – perfect for an alternative Christmas get-together. A relaxed morning of demonstrations followed by lunch. A pressure free reward for a hard working team. A day of hands-on cookery tuition. Learn together as a group, get to know each other and share a common experience outside the office environment. A challenging day of tasks for your team. We turn the heat up with a series of challenges for the team, providing expert input along the way. The team will need to work together, communicate, learn and apply their learning, organise themselves effectively and demonstrate initiative and resourcefulness. By the end of a full day the team will have produced a top class dinner which they can then relax and enjoy in the Fir Mount House dining room. Wine and Food Matching. Prepare the finest food, match it with the finest wine and eat it in the finest company. We will bring in a wine expert who will teach you how to choose wines to match your meals. We are also able to offer off site corporate and Team Events at a location to suit your group. Recent Clients: Opun, Deer Park Country House, Morso UK, The Forestry Commission, Beohringer Ingelheim, Cancer Research UK, American Express, Ridgeway School, Slow Food Movement, Soil Association, Dairy Crest, Astra Zeneca, Aga UK. Contact us to find out more about group or private bookings. We regularly give cooking demonstrations and talks on a wide variety of subjects. 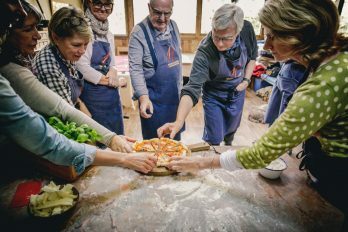 This can range from wine and food matching taster sessions, bread making demonstrations, pizza making workshops with our mobile pizza oven, to fish masterclasses. We have worked with schools, WI groups, reading clubs and many other special interest groups. Our talks are always informative, light-hearted and usually involve tasting some rather delicious food. 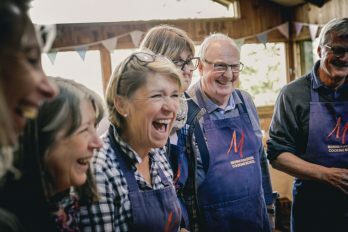 Talks and demonstrations can take place at the school but we are also able to run talks, demos and cooking classes at alternative locations and have delivered classes in holiday homes, restaurants, private homes, village halls and at food festivals across the country. Fish talk and demo for Slow Food Devon. Fish demo and tasting session for WI at Ashprington Village Hall. Catch and Cook Mackerel; Day with Torbay Cost and Country Trust. Pizza Workshops at Love Food Festival, Bristol. Asian Cooking Evening with local Womens Group at the School. Wine and Food Matching evenings at an independent wine retailer. Bread making classes for WI at a Village Hall.